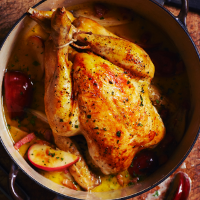 A comforting yet undeniably impressive British take on the French classic, poulet à la Normande. Crusty bread is essential for mopping up the juices. 1. Preheat the oven to 160 ̊C, gas mark 3. Heat a large casserole over a medium heat and fry the lardons for 10 minutes, stirring occasionally, until golden. Scoop out, leaving the fat behind; set aside. 2. Turn up the heat slightly, season the chicken and add breast-side down so it’s leaning on one side. Fry for 10 minutes, until the skin is deep golden, then turn and cook on the other breast for 10 minutes. You want a nicely browned skin, so take your time. Turn the chicken over to brown the bottom, then lift it out and set aside. 2 tarragon sprigs and the stock; simmer for 1 minute, scraping up any golden bits on the base. Sit the chicken on top, breast-side up, cover, and roast for 1 hour. 4. Remove the casserole, transfer the bird to a plate and rest under a loose sheet of foil for at least 15 minutes. Discard the tarragon sprigs, then put the casserole on the hob and add the vinegar and calvados. Bring to the boil and simmer for 3-4 minutes, until syrupy. Chop the remaining tarragon leaves and stir in with the cream and lardons; heat through. 5. Carve the chicken and return any juices to the pan. Serve the chicken with the sauce, and some crusty bread, if liked.